Petition form for the signatures is at the bottom of this site. Observe with great concern the process of zoning of Tatra National Park. Assumes interventions even in the no-take area (zone A). Spoil the positive trend toward favourable conservation status in the no-take area of forests affected by windstorm and other habitats in the lower part of Tichá Dolina Valley. Therefore the members and supporters of nature conservation societies in the whole Europe urge the proponents, the competent regional environmental authorities, the Ministry of Environment of the Slovak Republic and the Government of the Slovak Republic to withdraw the submitted proposal of zoning of the Tatra National Park placed at https://lt.justice.gov.sk/Document/DocumentDetails.aspx?instEID=-1&matEID=2586&docEID=108988&docFormEID=-1&docTypeEID=1&langEID=1 (In Slovak). We also request that a new proposal of zoning in compliance with the international guidelines [1,2] will be prepared involving experts and the public and that this zoning will permit the development of tourist centers only if nature conservation requirements are met, so that further generations of Slovak citizens, Europeans and people from all around the world can visit the Tatry Mts and enjoy the widest variety of their unique natural heritage. Finally we authorize the following members of the petition board to act in this matter in the sake of nature conservation according to Slovak constitution article 27. Tatra National Park lies in the Tatry Mts (north Slovakia). The National Park covers an area of 738 km2 on the border with Poland and is dominated by the highest peak in Slovakia, Mt. Gerlachovský štít (2655 m a. s. l.). The primary purpose of the park is to conserve the valuable high-mountain ecosystems such as near-natural mountain forests, alpine habitats, mountain lakes and streams as well as glacial and rock relief. Due to the specific location, highly isolated from other high mountains, unique flora and fauna has evolved here with many endemic taxa such as the subspecies of Chamois and Marmot and other endemics (e.g. Tatra Pine Vole Microtus tatricus). The native forests, dwarf pine scrub and alpine meadows above the upper treeline are home also to many rare declining bird species whose abundances, unlike the other sites in Slovakia, show no decrease (e.g. Capercaillie). However, the proposed zoning of the Tatra National Park would allow the destruction of the most valuable areas that play a key role in the conservation of animals, which are part of the identity not only of Tatry Mts, but for the whole of Europe. 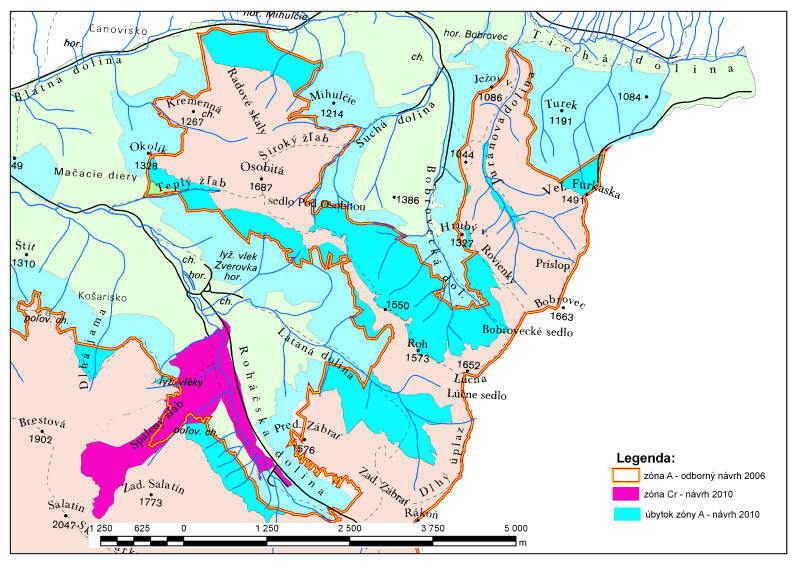 For example the sole proposed zone of tourist development in Salatínska Dolina Valley would lead to the destruction of important breeding sites of Chamois, at least seven Marmot colonies and important leks of Black Grouse. We attached several pictures from Roháčska and Salatínska Dolina Valleys and surroundings that were proposed as a part of the tourist development zone (particularly the ski resort) and thus are directly endangered by the proposed excessive development of tourist activities. View at ridge of Roháče in the West Tatra Mts. Actual photo of marmot from the site, which should be open for development of ski resort. Actual photo of chamois from the site, which should be open for development of ski resort. Actual photo of Golden Eagle from the site, which should be open for development of ski resort. Actual photo of Black Grouse from the site, which should be open for development of ski resort.